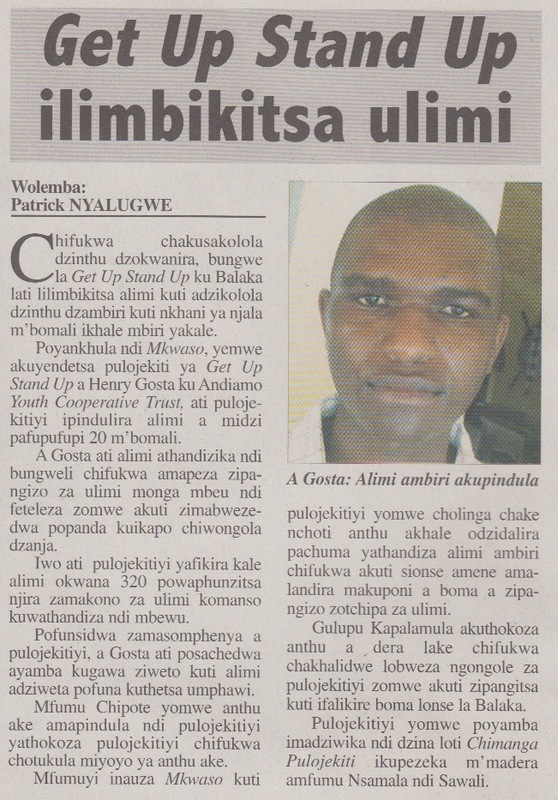 Get up stand up Project has performed tremendously. The good news is all over the streets, no wonder it cannot escape the spheres of Mkwaso Newspaper. The project so far has reached out to 20 villages from Traditional Authorities Nsamala and Sawali of Balaka. At least 320 farmers have benefited from modern farming methods as preached by Get up stand up Project. Chiefs Chipote and Kapalamula have saluted the project’s move to alleviate food shortage by bumper yielding techniques and its easy access of loans with no interest. The beneficiaries are in turn advised to settle their loans in time as sign of appreciation. Henry Goster; the project manager disclosed in an interview with Patrick Nyalugwe of Mkwaso that the Project is to distribute livestock to farmers shortly to improve their livelihood. This entry was posted in News from Malawi, Social Development and tagged Balaka, chipote village, Get Up Stand Up, Harry Pongolani, Henry Goster, kalapamula village, Mkwaso newspaper, Patrick Nyalugwe, S/TA SAwali, T/A Nsamala. Bookmark the permalink.